Freedom Museum USA in Pampa, Texas has a unique opportunity to obtain this aircraft for display prior to the plane being placed into the “graveyard” in Arizona. By bypassing that step, costs of moving this aircraft will be only $33,000 a considerable savings of the costs which would be incurred should it be required to move the plane back from Arizona. Most versions of the F-105 were fighter/bombers and many served as “Wild Weasels” for SAM Missile suppression in North Vietnam during that conflict. These aircraft had several nicknames: Thud, Super Hog, Ultra Hog, and Lead Sled. 397 out of 833 were lost in combat or operational accidents in the Vietnam conflict. This aircraft is in pristine condition and if we are to have it from the graveyard, we need your help! 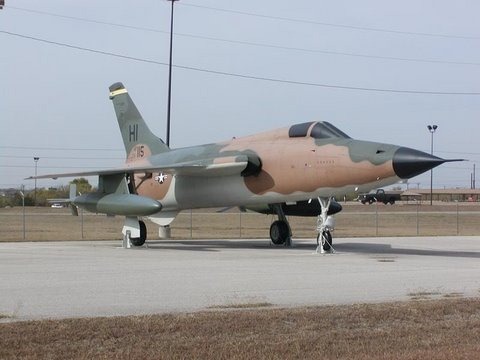 If you are willing to make a donation, please send your check to Freedom Museum USA, 600 N Hobart, Pampa, Texas 79065 and designate the funds for “F105D”. We are a non-profit organization so all contributions are tax deductible. Also, if you know of a great way to raise money for this opportunity, please let us know. And, please share this post with your family and friends. Only by remembering the past can mistakes be prevented in the future.